The amount and type of detergent you use in your washing machine can impact the washer's performance over time. Using too much soap can lead to too many suds, which can cause various parts, including the bearings, to deteriorate and ultimately become permanently damaged. The same problem can occur if you use the wrong type of detergent in your washing machine. Refer to your washing machine manual for operating instructions before you use your washer or if you experience problems with the appliance. The wrong detergent can cause a washer's bearings to wear faster. Regardless of how soiled the laundry you're washing might be, don't assume that by adding more detergent to the washer that clothes will come out cleaner. The truth is that adding more detergent than what's necessary to clean clothes can actually cause your washer to generate excess suds. The additional suds can cause water to leak from the washer when it's running and can leave a sticky residue in the tub after the wash cycle ends. The residue also gets on several of the washer's main components, such as its bearings, and makes them corrode. See that the amount of detergent you use matches the load size you're washing. Although powder detergents are generally cheaper than liquid detergents and often just as effective, powder detergents don't always dissolve fully in the washer, especially if the machine is running a cold water setting cycle. The undissolved powder will usually form a paste that gets on the washer's components and causes them to rust. The bearings are usually one of the components affected by undissolved powder detergents. Use powder detergents only when operating the washer on a hot water setting cycle, and use liquid detergents for cold water setting cycles. Liquid detergents are pre-dissolved and are more likely to rinse away after a wash cycle finishes. Never use a conventional laundry detergent in a front-loading washing machine. A conventional detergent is formulated to produce suds based on the amount of water that a washing machine uses. 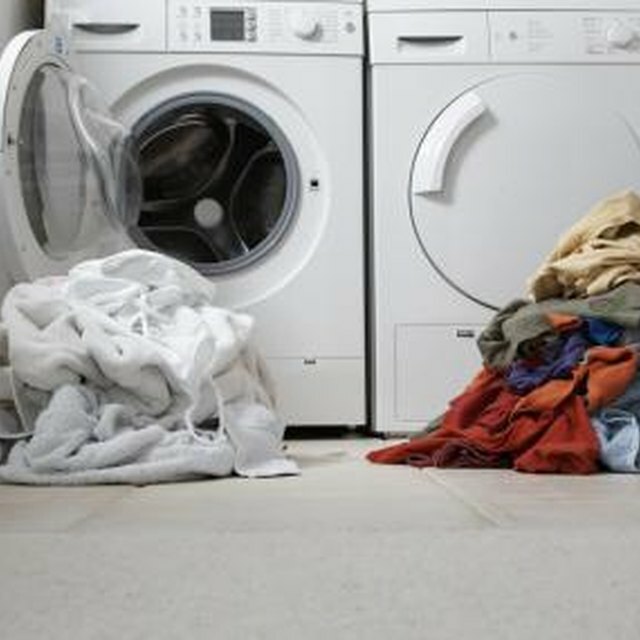 Since front loaders use less water than traditional top-loading washing machines, a conventional detergent will lead to the washer oversudsing, which can damage the washer's components, especially the bearings, and cause the washer to overflow. If you have a front-loading washing machine, run it only with a high efficiency detergent. Although you might think you're saving yourself time by overloading your washer, you might actually be causing damage to the washer and its components. An overloaded washing machine has to work harder to operate. For example, the tub's bearings might strain to maintain the tub's position as it spins inside so that it doesn't hit against the cabinet. In addition, rarely does an overfilled washer have enough room for detergent and water to enter fabrics and clean them well. Consequently, a certain amount of detergent might linger in the washer and deposit on the bearings and other components. Refer to your washing machine manual for guidelines on recommended washing machine load sizes. In general, you should not fill your washing machine so that's its more than 3/4 full. How Often Should the Washing Machine Be Cleaned?